freestompboxes.org • View topic - Strange Phase Inverter in Geloso tube amps? Strange Phase Inverter in Geloso tube amps? I am working on this nice little 60s Italian PA tube amp... It sound very good in stock condition thanks to some smart tricks: shielding the preamp and feeding it negative voltage for the heaters. But the PI is something I have never seen in a guitar tube amp. Both plates of the sides of the PI are connected to the output tubes, but there is an extra connection between the cathode of one of the PI sides to the other output tube. Re: Strange Phase Inverter in Geloso tube amps? It's a standard AC-coupled cathodyne PI, just stare at it long enough to connect the right dots from the oldschool drawing. See here for reference. It's the right variant using cathode bias. The additional 10k/500p is a lowpass/treble filter. So the part AC coupled seems to be important: you mean that plate1 is connected to grid2 trough a 22nF coupling cap, thereby blocking DC? If there would be a resistor there, it would be an DC coupled cathodyne? It's not like I want to change this setup, I think it sounds good. 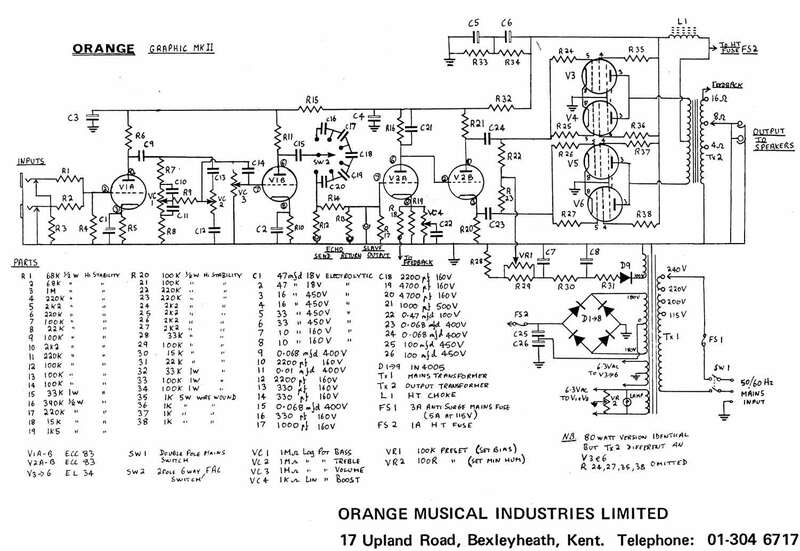 At least it is the only part of the circuit radically different from any guitar amp I have seen. The only reason I want to know it that I would want to implement a PPIMV -- post phase inverter master volume... in Marshall style. Is that possible with different resistors on the output tube grids? The first triode is just a standard gain stage, it is not part of the PI. Yes, that's what it means. A capacitor is used to block DC, hence only AC signals can pass. This setup has been used in many other amps, like the vintage Orange amps for example. HERE with AC-coupling, HERE with DC-coupling. The different resistors are rather curious. 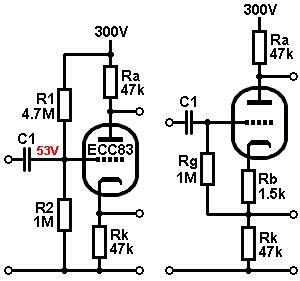 There is also the 50p cap at the upper EL84, not sure what is the reasoning behind this asymmetrical circuit. Maybe they tried to compensate for any asymmetry stemming from the cathodyne, or some sort of oscillation prevention. In any case, yes you can build a PPIMV into it, the unequal values won't get in the way with that. Keep in mind though, if you reduce the volume low enough, at some point the feedback loop will stop working properly, which does change the sound a bit. But then again, you might not care too much about that at lower volume. marshmellow wrote: It's a standard AC-coupled cathodyne PI, just stare at it long enough to connect the right dots from the oldschool drawing. See here for reference. After three days of staring and thinking it is not the SAME I suddenly saw the light -- thanks. You are absolutely right. Of course the first part of the second triode is a gain stage: signal from grid to plate -- but still inverts the signal. The output impedance on the anode side is much higher than on the cathode side. For an ECC81 in this scheme roughly 40k and 2k. You can 'equalize' this by setting a higher resistance in series with the cathode signal output than in series with the anode signal output. Normally that would not matter much, but something else will be added: if the lower output tube grid current were to start pulling, that would cause enormous distortion especially at the anode output of the ECC81. In order to prevent worse, the lower output tube apparently gets the 47k grid 'stopper'. The upper one also gets 1k; it is customary to equip end tubes with grid stoppers (resistors) of, for example, 1k, in order to nip VHF oscillations in the bud. The reasons it is not popular in guitar amps is proably the gain factor being 0.9 as mentioned here. its not popular as a guitar amp because at the time these were conceived and built there were only generic mono amps for microphones,accordions,phonographs etc. the whole guitar thing happened later with proper choice of eq section,gain,LTPI. Yes, nothing but a generic "cathodyne" phase inverter there. ...And overall the setup is pretty generic too: Since cathodyne does not have voltage gain (only insertion losses) there is a common cathode amp input stage for voltage amplification. The same stage also receives negative voltage feedback from the output. Feedback goes to the cathode, as is the most generic setup, and the feedback ratio is defined by the feedback and cathode shunt resistors, which effectively form a voltage divider. Very typical arrangement to couple with cathodyne indeed. So I beg to disagree about CC+cathodyne input stage not being "popular" in guitar amps. No, maybe not in Fender or Marshall amplifiers (and all those amplifiers that were derived from those designs) but yes, still very typical and popular choice in many other guitar amps, such as the aforementioned Orange, Sunn, Ampeg, Magnatone, Gibson, etc. Overall I would think this is the second most popular phase inverter scheme after long tail pair. The reason why this type of PI is avoided in some amps is that it clips very nastily. It clips HARD and also produces ton of other "not-so-nice" overdrive artifacts that create a lot of high order harmonics. If overdriven hard it has very asymmetric output due to different output impedances of plate and cathode. Basically it doesn't have the smooth "soft" clipping overdrive characteristic of a differential-type phase inverter (e.g. LTP) and that will be reflected in overall tone of the overdriven power amp. teemuk wrote: The reason why this type of PI is avoided in some amps is that it clips very nastily. It clips HARD and also produces ton of other "not-so-nice" overdrive artifacts that create a lot of high order harmonics. If overdriven hard it has very asymmetric output due to different output impedances of plate and cathode. Basically it doesn't have the smooth "soft" clipping overdrive characteristic of a differential-type phase inverter (e.g. LTP) and that will be reflected in overall tone of the overdriven power amp. Hey thanks for the comment! This is absolutely the case... the distortion was pretty nasty. I will eventually change to LTP, it's unavoidable if this amp is to have a future for guitar. For now I put a 1M resistor before the grid of the PI, which fixed part of the nastiness.